I have been seeing a CD for sale on e-bay for awhile titled "Making the Ford Fleet-Footed" "Speed and Sport Bodies A to Z". I finally bought one (22.00 with free shipping) I have no connection to the seller or even know who he is, but the CD is well worth the money if you like Speedsters. I believe there are over 400 different ads and catalog pages. The catalogs have been copied completely. All are nice and clear (at least as clear as the original was) Everything is printable and it comes with good instructions for different operating systems. Ill post his e-bay user ID later, I do not have it right now. I just thought I would pass the info on to other speedster guys and, I think it is worth the money ... "in my opinion"
Been awhile since I looked at my copy, but I will add that I also think it is a great resource for anyone interested in speedsters. If you like Model T's and have any interest in speedsters this is a great CD. 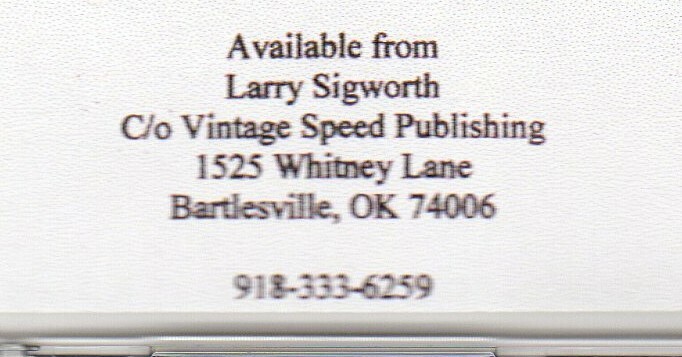 Larry has a collection of advertising info on speedster bodies and accessories that is probably one of the largest in existence. Lot of neat stuff on it. Larry has done a great job on this disc and his other speed disc and both are great value for money. I have copies of both and hey are great references.